Double Puller System ­­­with inbound and outbound railcar pullers and rabbits. The inbound rabbit indexes railcars into an area near the inbound shop door. The outbound car puller indexes the railcar to the repair area and also discharges the railcar back into the yard. Single Puller System with a single rabbit and puller moving railcars into the shop and also discharging them. The mechanical rabbit includes a car puller unit with electric motor, fluid coupling, magnetic brake, and rotary cam limit switches. The rabbit is moved by a closed cable system, the wire rope being wound on a drum driven by the motor. Counterweight towers and other accessories are included with the system. 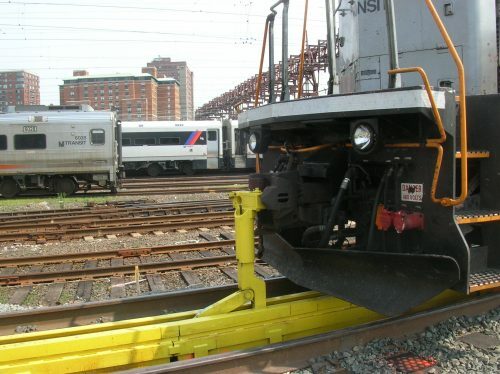 For mechanical rabbits, various sizes of electric railcar pullers are available with single, two, or variable-speed drives. Single drum units with magnetic brakes and rotary cam limit switches are standard. For hydraulically-powered rabbits, it is pulled forward during the active stroke by a heavy-duty conveyor chain and is returned to the home position by a flexible wire rope.